COMMENTS: a must have in my face masks! COMMENTS: Works great in my sugar scrub. COMMENTS: After 3 formulations I perfected what I want hand cream to feel like and I achieved it with this wax!! The price is great and I will definitely continue to buy. For those who want to know my breakdown is 65% aloe water, 3% steric acid, 6% this wax the rest all shea butter. It is truly perfect imo. Not greasy or sticky... it doesn't even require a lot of rubbing in. I am totally hooked on my own hand cream!! I had no idea it was possible to make such a nice product and I definitely think this wax is huge contributing factor! COMMENTS: I put this in lotions and lip balms. I love the the silky version as well they both are a must have in lotions. "Emulsifying wax is the best for lotion"
COMMENTS: I love this product. It makes my lotions awesome. COMMENTS: Something I didn't know I needed, until I didn't have it! COMMENTS: Very happy with this purchase! Love how it feels in lotions. COMMENTS: I use this in my lotion and cream products. It is consistently efficient at binding oils and water. Great quality product, as usual. Thank you. 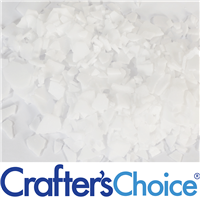 "Crafters Choice™ Emulsifying Wax - Traditional"
COMMENTS: My sales have doubled since using this product to make lotions. Been a customer for 5 years and will always be. "Emulsifying Wax - Traditional "
COMMENTS: PERFECT!I stand by this. Leaves a soft smooth feel in my handmade lotions. COMMENTS: I use this product in my goats milk soap. I've only ever had one issue with my lotion, and that had nothing to do with the wax. It's a dependable product at a great price! COMMENTS: I use this product in my goat milk lotion, and am very happy with it! This makes a very creamy lotion that stays together. "First time buying Emulsyfyimg wax"
COMMENTS: I never knew I could make lotion on my own.I've learned so much from shopping here and studying.I thought beeswax was an emulsifier! Using Emulsyfyimg wax has changed everythimg! I can't wait to make more stuff! I will be shopping here for all my needs! COMMENTS: works like it should! COMMENTS: I use this to make lotions and body butters. The texture always turns out so great, creamy and silky. I have reordered this product several times and enjoy its consistency. I never have to adjust a recipe because i'm using a new batch of wax. COMMENTS: I have been using this emulsifying wax for well over a year now! It performs well and is consistent in my lotions and sugar scrubs. Would definitely recommend. COMMENTS: This wax works wonderfully and makes my lotion come out perfect every time. Great product! COMMENTS: I am a newbie when making lotions, and this was my first purchase of this type of product from anyone. It works great and does exactly what it is supposed to do. Measures well and melts evenly and quickly. COMMENTS: I love this E wax, it is affordable and very versatile. COMMENTS: A must have for my lotions! Can't beat the price either! COMMENTS: Very easy to use, works very well. No complaints. Again I love all your products. COMMENTS: Great product at a great price. I use this for my sugar scrubs but it has a variety of uses in other recipes. <3 Highly recommend. "Makes creamy lotion every time"
COMMENTS: This emulsifying wax is a must-have for our lotion line. It melts easily and blends thoroughly, ensuring a thicker, creamy batch of lotion every time. It leaves skin soft , not greasy feeling. Customers love the texture of our lotion. This produces a bit heavier, thicker lotion. COMMENTS: Nothing better than free shipping when you order 50# at a time. Thanks!! COMMENTS: Easy to use and works well. "Lotion with emulsifying wax - trafitional"
COMMENTS: Melts & blends well. COMMENTS: Does what it should, emulsifies well for lotions. COMMENTS: Great product. Use it all the time in my lotions and creams. COMMENTS: I really like this in lotions, I have used this and soft and silky, I can only tell a small difference in the feel, and for the price this one is hard to beat. COMMENTS: Easy melt, easy to work with. We use it with lotion and havent had any problems. COMMENTS: This emulsifying wax works perfectly in balancing all my lotion mixes. Once I had the right measurement, it was amazing. COMMENTS: This was absolutely perfect for my bath melts and sugar scrubs! COMMENTS: I love this Emulsifyer the best! It gives a thicker feel than the others. Most people purchase the lotions with this one over the lotions with the soft and silky. I also live in a climate where it's very dry, we need that nice moisture feel up here. This also works amazing in my sugar scrubs to keep my oils from separating.....I won't go back to traditional scrubs again!!!! COMMENTS: I don't like having free flowing oils in my scrubs, so I use this wax to make an emulsified lotion base before i add my sugar. It works equally well in lotion for a think, creamy finish. COMMENTS: The best formula ever for my de tangled spray! COMMENTS: I use this in my lotions and bath bombs. Helps bind the oils in the water with bath bombs. COMMENTS: The traditional e wax is my go to emulsifier. Its the only one I use in my sugar scrubs and body butters because of the thick consistency it gives the product. If you want a dense, thick lotion this is what you want to use. For something lighter I use the Soft & Silky version. I've never had any problems with any emulsifier from WSP. Thank you for always being consistent WSP! COMMENTS: This is very nice and easy to use e wax! COMMENTS: Thos e wax is perfect for detangling sprays, facial cream and hand lotion. It's easy to use and you can't beat the price! COMMENTS: I have only ever used this in sugar scrubs and it works perfectly. COMMENTS: I used this in almost everything that i make. Very easy to work with. Melts quickly. Pulls everything together to make a nice and thick consistency. It's also very cost effective. COMMENTS: Love this stuff. By far my favorite that I have found!!
" Emulsifying Wax - Traditional"
COMMENTS: I USED IT TO MAKE EMULSIFY SCRUB AND LOTION.SATISFY WITH THIS PRODUCT.THANK YOU. COMMENTS: Works Perfectly! Bought this and tried it and then purchased the Soft & Silky wax. For the price, and quality, I plan to stay with this one. COMMENTS: Makes product smooth! Great for from scratch lotions! COMMENTS: I used this in my body butters and it made it so smooth, and it brought the whole product together. COMMENTS: I use it in an emulsified sugar scrub. I like how the end product turned out. COMMENTS: I used this in my emulsified scrubs as well as in my lotions. I love it and will reorder! COMMENTS: This was my first time making lotions and this emulsifying wax worked well in my lotion formulation. It's also very easy and beginner friendly. COMMENTS: Must have for handmade goodies. My hubby and I both love using this in our lotions, scrubs, body butters etc. COMMENTS: A great product for making lotions. I could not make lotion without this important ingredient. COMMENTS: I love emulsified scrubs - this works great in my recipe. Leaves your skin super soft + not greasy. COMMENTS: This product makes a great lotion bar that is very smooth. I love mixing it with bees wax for a great product. COMMENTS: Very easy to measure out, makes a creamy lotion! COMMENTS: I was so happy with my this product and very surprised that my first use turned out so well, it was very easy to use and now that Im on a roll, all of my family and friends will have something I created for christmas... I did my price comparisons for this product before my purchase and I could not find it any cheaper. shipping was reasonable and fast. I couldn't be more happy. COMMENTS: A must have for any from scratch lotion recipes. COMMENTS: A great product, a must for my lotions. COMMENTS: Works well to emulsify my oil and butter formulas to produce a white, heavy, creamy lotion. COMMENTS: This emulsifying wax always gives great results. The lotions and creams turn out nice and thick, white, and stable. I've never had any problems with separation with this wax, even if I stop blending while mixture is still warm. It's easy to use and a great value. COMMENTS: This wax binds my products perfectly everytime. I wouldnt be able to operate without it! COMMENTS: This is my first time using this wax and I love it so far. Works wonderfully for my emulsified sugar scrub! COMMENTS: Got this with a scrub kit. First time emulsifying scrubs. I think we'll use more of it. COMMENTS: Worked like a charm! Great product! COMMENTS: This is the best price and works just as well as the more costly one. I use this for my premier lotion. COMMENTS: I wasn't sure how i would like this wax for my scrubs but now i won't make any scrubs without it, the texture and the way it feels on my skin is wonderful. COMMENTS: I am very satisfied with how my lotions feel and absorb. The only time I had a problem was when my ewax had expired. My lotions began separating after combining the oils to the liquids no matter how much I mixed. Once I realized the problem I just ordered new ewax and am on the road to making great lotions again! "Great in sugar scrubs and body butters. " COMMENTS: This is a great stablilizer for butters and scrubs! "A must have for all lotions!" COMMENTS: A staple in my homemade product making supplies! COMMENTS: I had never used emulsifying wax before, but I had read about it. This wax met all my expectations, and I plan to use a lot more in the future. I will definately be ordering again. I was very pleased with the results, especially in my aloe bars, because I had had a problem previously with the aloe liquid and witch hazel seperating from the oils. COMMENTS: Works very well in my lotion. Does its job of allowing all the ingredients to stay together and allowing for great texture. COMMENTS: I tried incredibly hard to make an all natural body lotion just using beeswax (with borax and/or baking soda). I got it to work 1 time, but every time after that my oils and water would separate. I did a tremendous amount of research on the topic and came to the conclusion that it just doesn't work well to use beeswax to make lotion (works great for heavy creams). Recognizing that this is not an all natural product, I decided I would be willing to use it because my product would still be significantly less chemical filled than commercial lotion. I am so happy I tried it. I made 8 batches of lotion and they are turned out amazingly well. I even used it for sugar scrubs and those turned out incredible too! It was so easy to use and the great thing is WSP gives you recipes on their site to use. I used the aloe and oatmeal lotion recipe and one of their emulsified sugar scrub recipes...it was so easy and they gave you step by step instructions. I already have ordered more (along with the stearic acid). COMMENTS: This wax is wonderful as an additive to my scrubs! My customers absolutely love my scrubs. It's my secret ingredient! I recommend trying this product. It makes the scrubs smoother if that makes sense. • Make available in tubs!!!! COMMENTS: I purchased it to make body butters. It has definitely improved the quality of the "whipped" body butter giving it a nice body to it. Makes your product go a long way. It is packaged in a nice pouch and is easy to work with. COMMENTS: great e-wax, does what it is supposed to do. easy to use and priced right! COMMENTS: I use this for my lotion and lotion bars and its gives a great feel to the products. "Good wax wish was available more often"
COMMENTS: Use it in so many different products. It is a necessary staple. Thanks for providing quality ingredients. COMMENTS: I am enjoying using this product. I would recommend buying it. COMMENTS: This item does seem to thicken up lotions.Gives a better quality to the product. COMMENTS: I use this wax in my salves. It works very well and leaves a smooth, creamy feeling. COMMENTS: use it all the time. never had an issue. COMMENTS: Lots of compliments on the whip, and the sugar scrub is not separating. This melted easily in water. I got a couple of bags so I will definitely be making more with this product. COMMENTS: I keep coming back to this traditional emulsifier because it always works as expected. I use it in my body creams to replace approximately 75% of the beeswax in the recipe, and the creams turn out beautifully every time. I highly recommend this product. COMMENTS: This one is used in our body mousse and I don't think we could make it as wonderful as it is without this. COMMENTS: We have been very satisfied with the performance of this product in our homemade lotions. It has helped our goat milk lotion become a great success. Melts down very well. COMMENTS: I use this in my lotion and love how it makes it feel soft and smooth. It melts easily. I like the sealable bag it comes in. Easy to work with. "WSP emulsifying wax can't be beat!" COMMENTS: Love the quality of this e-wax! Perfect for my lotion recipe! "Works well to thicken lotions and creams"
COMMENTS: Wonderful to use in emulsified sugar scrubs for a "lotion" type scrub when mixed with water. COMMENTS: This is a great addition to my lotions and creams. Very easy to work with. COMMENTS: This emulsifying wax is wonderful when used in my lotions and lotion bars. Really makes my lotions be of a thicker consistency, which is what I want. COMMENTS: This emulsifying wax worked perfectly for my magnesium lotion as well as for a pain lotion with essential oils. The feel it gave the lotions was soft and smooth. It sets up perfectly every time. Thanks for a lower cost, high quality product! COMMENTS: I made to batches of lotion one with this emulsifier and one with the Soft and Silky. I didn't notice much difference. This is priced very well and is reliable. COMMENTS: Use it mostly in scrubs and can't imagine being without again. COMMENTS: This is an excellent wax that I use in my lotions & it works great. COMMENTS: I had tried the soft & silky ewax and thought I'd try this for a comparison. To me, this wax (used in a lotion) feels dryer on my skin compared to the soft and silky. Some friends, however, didn't feel a difference. I have no issue with its performance. I only gave it 4 stars not because I don't think it's a good product, only because my preference is for the soft and silky ewax. COMMENTS: This e wax is perfect. We use it in several products, including bath melts, and it performs perfectly each time. Love it. "Perfect for just about everything"
COMMENTS: Creates a perfect lotion at 5% usage rate.. and I even add it to bath bombs and sugar scrubs to help the oils blend with water. It is my "bath truffle" secret ingredient, but do note it causes foaming in bath bombs rather than fizzing. "Fantastic Wax for Lotions, etc." COMMENTS: This emulsifying wax melts very easy and blends wonderfully! I have used this in my lotions, creams, etc. for a long time now - I love how WSP packages this - easy to use, easy to melt....Recommend for anyone! COMMENTS: Love using this in my emulsifying body scrubs, easy to use! COMMENTS: This was my first time using this product, I made one of the sugar scrub recipes(thank you) and love the feel of it. It melted easily, clean up was a breeze and love that the finished product was greasy. COMMENTS: Excellent product for making lotions. Easy to measure and melts easily into oils. COMMENTS: Worked wonderfully in my lotions! COMMENTS: I wouldn't even think about making a body scrub without this because I hate having oil left over on my body. When mixed properly with my body scrubs, my skin feels moisturized and clean without that slimy/oily feeling. Plus, it is a great price and a consistently accurate product. Will buy again and again. "Omg this is the best thing ever "
COMMENTS: I love this emulsifier, I use for most everything that has to do with lotions, creams and body butters, sugar scrubs. I love it, I have other emulsifier but I always use this one the most. It works super great in lotions. COMMENTS: This is another one of my staple ingredients. I've used WSP emulsifying wax for several years and keep coming back for more! It's very versatile...holds scent perfectly and makes my handmade lotions and creams absolutely dreamy without being "greasy!" Excellent product for the money! "I bought this and I love it"
COMMENTS: I will be buying more. I bought this to make lotion, salt/ sugar scrubs, and it worked like a charm. "Adds great thickness and texture"
COMMENTS: Adds a nice thickness to make creams and lotions more dense and luxurious. Will keep using this one. "Great in butters and lotions"
COMMENTS: I use this e-wax in all my body butters and lotions, it is easy to melt and produces a silky smooth product. "This is wonderful for lotions!!!" COMMENTS: I am using this in Goats Milk Lotions and I just love it. The batches come out very nice everytime!!! COMMENTS: Made a big difference in my product!! COMMENTS: This product performs perfectly in emulsifying scrubs and lotions! Great product! Will definitely be buying in a larger quantity next time. COMMENTS: I have yet to have my formulas fail with this! COMMENTS: I have bought bulk size of this item several times. The quality is great and that little resealable ziplock that comes with it; make it very convenient to use and store. I have never had any problem making lotion with this, and am very pleased with the quality. COMMENTS: Works amazing when making lotions! COMMENTS: We use this emulsifying wax in our body lotion, excellent quality, reasonable price. COMMENTS: What is there to say! This is what I use to emulsify my lotions & sugar scrubs! COMMENTS: This product works well melts easily with my oils and butters. COMMENTS: Found it increadibly easy to use, makes very nice lotions, prefer to use it without stearic acid, since it feels thick enough on it own. COMMENTS: Used this in goat milk lotions. It created a nice thickness of product and no separation of liquids and oils. "Helps to make a great base lotion"
COMMENTS: Received my order just a few days ago and wanted to start testing with it right away of course. Haven't even actually made lotion prior but the e wax was super simple to use. I just used microwave bursts to melt it with the oils and shea butter. The end result was a nice medium thickness lotion. The wax melted relatively quick, I had to wait longer for the stearic acid to melt. Very pleased with the e wax for the price. COMMENTS: This emulsifying wax works much better than regular wax says and is about half the price of the regular wax. I use it in lotion and it makes the water and oil's combine. COMMENTS: Works really well. Excellent texture. Very versatile. I can get my lotions as thin or thick as I want by varying the amount of wax. COMMENTS: Very glad to be able to purchase this for my lotions and scrubs. Really like the packaging. COMMENTS: A must have in lotions. COMMENTS: I am a big fan of this traditional type Emulsifying wax. Gives the lotions a great thick creamy feel. "Great quality with affordable price"
COMMENTS: Works well in my emulsified scrubs. Reasonably priced as well! COMMENTS: I recently decided to try out an emulisfier, as I've previously been using stearic acid in my scrubs and lotions, and this product works wonders! A little goes a long way with this product. Adds thickness to my lotions and helps with separation of my scrubs. Great value for the quantity, as I said a little really does go a long way with this stuff. Going to try the soft and silky too, the next time I order. COMMENTS: How did I miss the boat on this stuff! It has made my life so much easier when combining water & oil based products like creams and body butters. I don't know where I would be without it. Great price and super easy to work with. I melt it double boiler style or in a crockpot on warm. Such a dream! COMMENTS: This makes my lotions feel so good. I have never had a problem with any separation of oils and water. COMMENTS: Perfect for emulsified scrubs! COMMENTS: Makes nice lotion. Smooth and creamy. COMMENTS: Same ol' G Love this stuff!! a little goes a long way! COMMENTS: I use this wax in our lotions and have had great results with it. It's easy to use/measure, melts quickly and makes a nice lotion that absorbs well and doesn't leave 'weirdness' on your skin after. COMMENTS: Very good. Makes lotions and body butters creamy! COMMENTS: I never thought making lotions from scratch would be so easy. This product is easy to use. Love that i can play with the consistency of my lotions from very thick to very thin. COMMENTS: I have been ordering this from here for years! Always works great for my needs and a great price! COMMENTS: Nice option besides beeswax. COMMENTS: This does exactly what it says it will. Nice and creamy. My folks love it.